I wish I would have recorded my 20 year old daughter eating one of these pulled pork sandwiches so that I could let you listen. Never in the history of ever has anyone enjoyed a sandwich more. There were shouts. There were expletives. There were proclamations of love and adoration. There were awkward moments when I thought I should maybe leave the two of them alone. 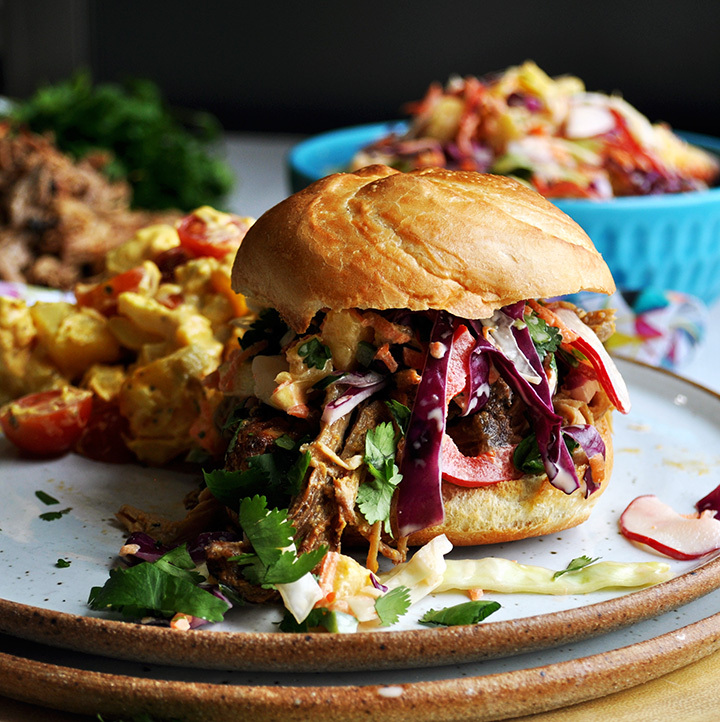 These pulled pork sandwiches are really quite scrumptious. Slow roasted pork is smothered in vinegar mustard sauce, piled onto a toasted bun and topped with pineapple coleslaw. There’s a whole lot of flavor going on in there. Here’s the other thing you should know about these puled pork sandwiches. Our neighbor happened by right after I made these, but turned up her nose when we told her what they were. She took a bite out of sheer politeness. Then snarfed down the whole thing in about 30 seconds. So, if you have people in your family who say things like, “pineapple coleslaw?” “vinegar mustard sauce?”, with their faces all scrunched up – do not be discouraged. One bite will win them over. A big shoutout to Beth Bowman of Bowman Ceramics for the handmade plates in these pictures. These plates are phenomenal. They are sturdy, practical works of art that somehow manage to be both casual and elegant at the same time. *Important recipe notes follow the recipe. 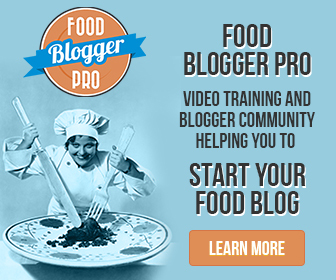 Add all ingredients to a bowl and whisk until completely combined. Put the carnitas in a bowl and pour mustard sauce over them. Toss in the sauce to coat. Lay the buns on individual plates. Top the bottom bun with about 1 cup of mustard sauce drenched pulled pork. 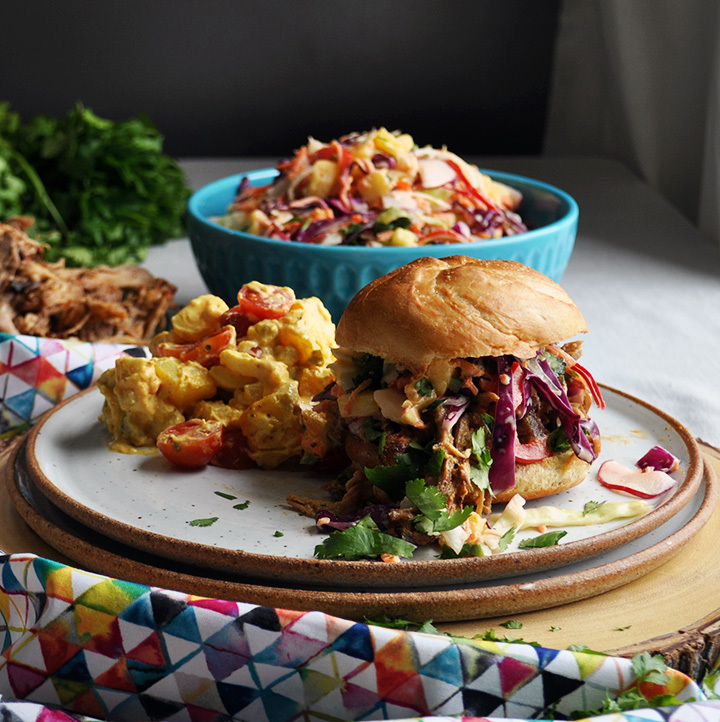 Pile on a generous amount of pineapple coleslaw. Top with the top bun and serve. 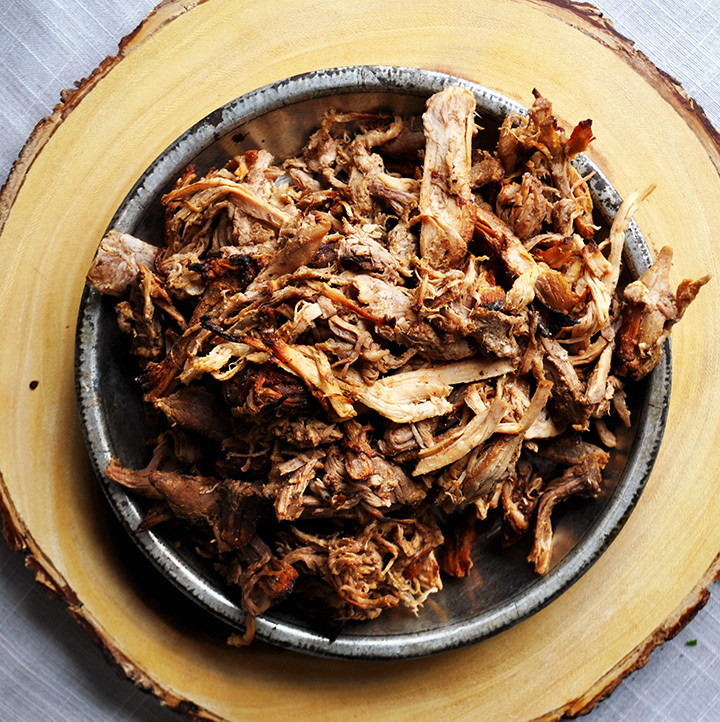 The recipe for Slow Cooker Pork Carnitas makes quite a lot, on purpose. I love to use carnitas in all sorts of dishes, and therefore love having leftovers. Carnitas make divine tacos, are delicious in Spanish Potato Soup, and elevate Baked Potatoes to a gourmet treat. They are perfect additions to your take-out freezer. 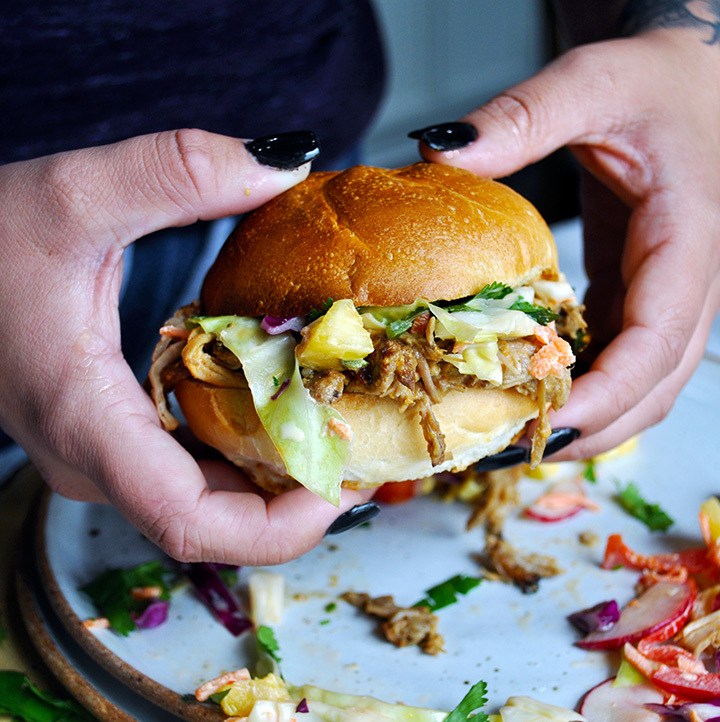 If you’re making this as a part of Spring Meal Plan #4, you already made Carnitas earlier in the week for Taco Salad and should have plenty of leftovers in your refrigerator just for these sandwiches. If you’re not making these sandwiches as a part of a meal plan and don’t want a bunch of leftovers, just cut the recipe in half. These sandwiches are the kind of thing that are an ideal use of leftovers. Slow Cooker Pork Carnitas are ridiculously good. And, with something so good, if you’re going to make it at all, why not make enough to carry through to other nights of the week? If you’re making these as a part of Spring Meal Plan #4, that’s exactly what’s happening here. You’ll have already made the carnitas for taco salad earlier in the week, reserving plenty in your refrigerator for these sandwiches. If you’re not making these as a part of a meal plan, get the carnitas going in the slow cooker in the morning. They’ll take around 6-8 hours on high, 8-10 hours on low. I’ve also let these cook in the slow cooker overnight on low, allowing me to just pull the tender pork from the slow cooker in the morning, throw it in the refrigerator, and finish it up that evening. 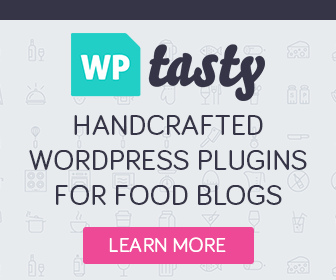 They are the kind of thing that taste like you’ve been in the kitchen all day but actually make the perfect weeknight meal. The Pineapple Coleslaw and Mustard sauce can be made in advance. Pineapple Coleslaw will keep well in the refrigerator for up to 5 days. The mustard sauce only takes about 5 minutes to throw together. BUT, having both on hand makes throwing these sandwiches together ridiculously fast. Pulled Pork Sandwiches were made to be served with potato salad. 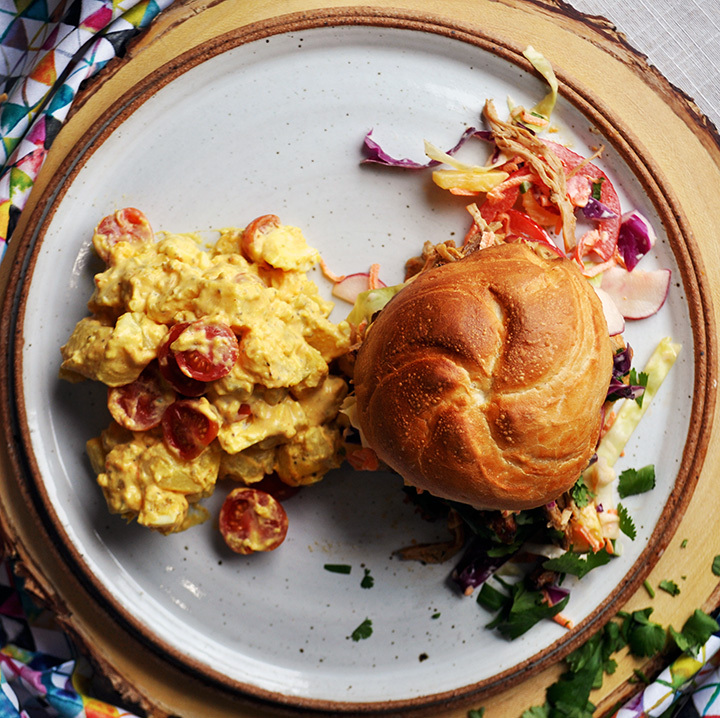 Mustard potato salad, topped with fresh cherry tomatoes is an amazing compliment to these pulled pork sandwiches. The flavors in the potato salad are similar enough to what’s going on in the mustard sauce and coleslaw to not compete. Instead, the creaminess of the potato salad is a delicious foil to the sharp flavors of the mustard sauce and slightly sweet coleslaw. 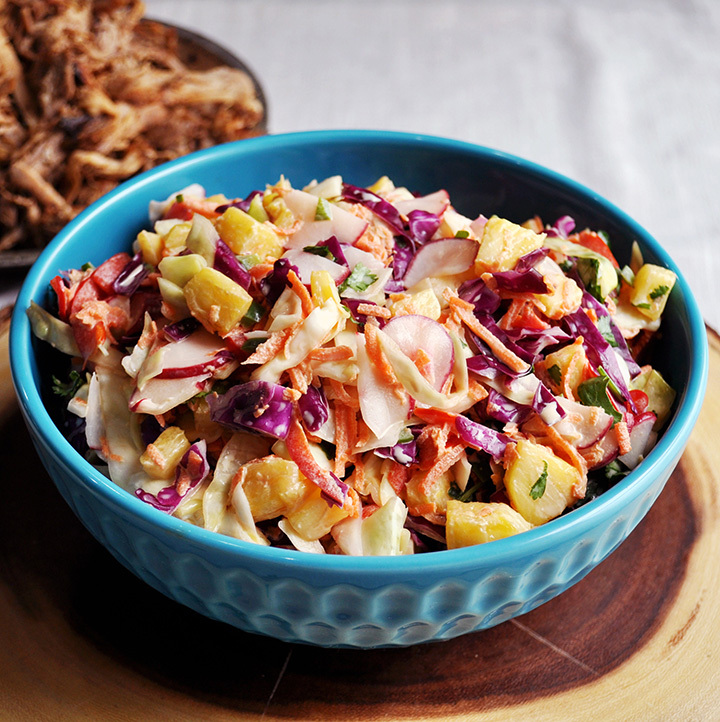 Pulled pork and potato salad belong together. Who are we to keep them apart?